Content is nothing without the right distribution channels, which is why content marketing and social media make a great team. Think Laurel and Hardy. Woodward and Bernstein. Jordan and Pippen. But how exactly do you use social media to your best advantage when creating your content marketing strategy? Which channels should you be using — and which do other marketers use? And what is the best way to use each channel? Tips for smarter content distribution through social media: Considering adding a channel to your social media repertoire, or just hoping to improve your chops on your existing channels? Either way, we’ve compiled tons of tips to help you move your social media strategy in the right direction. Snapshots of brands that are using social media to its full advantage: 58 Social Media Tips for Content Marketing includes examples of how big brands have been using major social media channels successfully. We take a look at campaigns from companies like Allstate, Dell, GE, Salesforce, Starbucks, Mint.com, and Red Bull to demonstrate best practices for leveraging social media in your content marketing efforts. Current marketer adoption rates for the most popular social networks: CMI recently published our annual content marketing research that shows which channels they are using most often. The results covered 14 different social media channels, including the “big 4” as well as everything from Tumblr to SlideShare to Instagram. Throughout the course of the eBook, you’ll find call-outs with the results of that survey split into B2B and B2C designations. 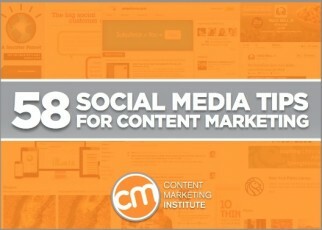 Read 58 Social Media Tips for Content Marketing to improve your sharing strategies and drive higher engagement rates for your eBooks, blog posts, videos, workbooks, and presentations. Like this eBook? Share it with your friends through your preferred social media channels. And if you are looking for more tips on using social media for content marketing, please let us know by posting a question in the comments.